Has 83 recipes, 2 public recipes. Has 336 flavors in inventory. Pricey666 supports All The Flavors. Upgrade yourself. 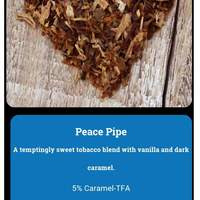 I'm going to start by saying this is not my recipe, it is just one I have been making for a while that is not on all the flavors, it's only available here http://makemyvape.co.uk/blog/peace-pipe. This is an amazing Ry4 recipe, I have been making this for friends that also fell in love with it. The original recipe calls for 4 day steep, I feel it's best after at least 2 weeks. But I've also vaped this right after mixing and it is delicious. This is very tasty as a shake and vape, I got a bit of a head cold so my taste isn't perfect but even with dampened taste this is great. The ap gives the crunch cereal that little bit of a dry note that you would expect from eating lucky charms and the sugar cookie and yellow cake give it a great cereal flavor. I'm impressed, this and your lime kiwi strawberry are gonna stay in my rotation for a while! Amazing recipe, tastes so complex for only having 3 flavors. very well done my friend!